This article is about the year 1895. For the 2008 film, see 1895 (film). January 5 – Dreyfus affair: French officer Alfred Dreyfus is stripped of his army rank, and sentenced to life imprisonment on Devil's Island. January 12 – The National Trust for Places of Historic Interest or Natural Beauty is founded in England by Octavia Hill, Robert Hunter and Canon Hardwicke Rawnsley. January 13 – First Italo-Ethiopian War – Battle of Coatit: Italian forces defeat the Ethiopians. January 17 – Félix Faure is elected President of the French Republic, after the resignation of Jean Casimir-Perier. February 11 – The lowest ever UK temperature of −27.2 °C (−17.0 °F) is recorded at Braemar, in Aberdeenshire. This record is equalled in 1982, and again in 1995. February 14 – Oscar Wilde's last play, the comedy The Importance of Being Earnest, is first shown at St James's Theatre in London. The gold reserve of the U.S. Treasury is saved, when J. P. Morgan and the Rothschilds loan $65 million worth of gold to the United States government. The offering of syndicate bonds sells out only 22 minutes after the New York market opens, and just two hours after going on sale in London. Venezuelan crisis of 1895: U.S. President Grover Cleveland signs into law a bill resulting from the proposition of House Resolution 252, by William Lindsay Scruggs and Congressman Leonidas Livingston, to the third session of the 53rd Congress of the United States of America. The bill recommends that Venezuela and Great Britain settle their dispute by arbitration. February 25 – The first rebellions take place, marking the start of the Cuban War of Independence. March 3 – In Munich, Germany, bicyclists have to pass a test and display license plates. March 4 – Japanese troops capture Liaoyang, and land in Taiwan. March 15 – Bridget Cleary is killed and her body burned in County Tipperary, Ireland, by her husband, Michael; he is subsequently convicted and imprisoned for manslaughter, his defence being a belief that he had killed a changeling left in his wife's place after she had been abducted by fairies. March 18 – The first worldwide gasoline bus route is started in Germany, between Siegen and Netphen. March 30 – Rudolf Diesel patents the Diesel engine in Germany. April 6 – Oscar Wilde is arrested in London for "gross indecency", after losing a criminal libel case against the Marquess of Queensberry. April 7 – Nansen's Fram expedition to the Arctic reaches 86°13.6'N, almost 3° beyond the previous Farthest North attained. April 14 – A major earthquake severely damages Ljubljana, the capital of Carniola. April 16 – The town of Sturgeon Falls, Ontario, is incorporated. April 17 – The Treaty of Shimonoseki is signed between China and Japan. This marks the end of the First Sino-Japanese War, and the defeated Qing Empire is forced to renounce its claims on Korea, and to concede the southern portion of Fengtien province, Taiwan, and the Pescadores Islands to Japan. The huge indemnity exacted from China is used to establish the Yawata Iron and Steel Works in Japan. April 22 – Gongche Shangshu movement: 603 candidates sign a 10,000-word petition against the Treaty of Shimonoseki. April 27 – The historic Spiral Bridge is constructed to carry U.S. 61 over the Mississippi River, at Hastings, Minnesota. The picturesque bridge is one-of-a-kind, and serves the citizens of Hastings for 56 years, until it is demolished in 1951. May 1 – Dundela Football, Sports & Association Club is formed in Belfast. May 2 – Gongche Shangshu movement: Thousands of Beijing scholars and citizens protest against the Treaty of Shimonoseki. May 9 – Thirteen workers are killed by soldiers of the Russian Empire during the Yaroslavl Great Manufacture strike. May 18 – The first motor race in Italy is held. It runs on a course from Turin to Asti and back, a total of 93 km (58 mi). Five entrants start the event; only three complete it. It is won by Simone Federman in a four-seat Daimler Omnibus, at an average speed of 15.5 km/h (9.6 mph). May 24 – Anti-Japanese officials, led by Tang Jingsong in Taiwan, declare independence from the Qing Dynasty, forming the short-lived Republic of Formosa. May 25 – R. v. Wilde: Oscar Wilde is convicted in London of "unlawfully committing acts of gross indecency with certain male persons" (under the Labouchere Amendment) and given a two years' sentence of hard labour, during which he will write De Profundis. June 5 – The Liberal Revolution begins in Ecuador, making the civil war more intense in this country. Britain annexes Tongaland, between Zululand and Mozambique. The Paris–Bordeaux–Paris race is held, sometimes called the first automobile race in history. The Kiel Canal, connecting the North Sea to the Baltic across the base of the Jutland peninsula in Germany, is officially opened. The Treaty of Amapala establishes the union of Nicaragua, Honduras and El Salvador (which ends in 1898). June 28 – The United States Court of Private Land Claims rules that James Reavis's claim to the Barony of Arizona is "wholly fictitious and fraudulent". July 10–11 – The Doukhobors' pacifist protests culminate in the "burning of the arms" in the South Caucasus. July 15 – Archie MacLaren scores an English County Championship cricket record innings of 424 for Lancashire, against Somerset, at Taunton. This record lasted until 1994. July 31 – The Basque Nationalist Party (Euzko Alderdi Jeltzalea-Partido Nacionalista Vasco) is founded, by Basque nationalist leader Sabino Arana. August 7 – The Aljaž Tower, a symbol of the Slovenes, is erected on Mount Triglav. August 10 – The first ever indoor promenade concert, origin of The Proms, is held at the Queen's Hall in London, opening a series conducted by Henry Wood. August 19 – American frontier murderer and outlaw John Wesley Hardin is killed by an off-duty policeman, in a saloon in El Paso, Texas. The Northern Rugby Football Union (the modern-day Rugby Football League) is formed at a meeting of 21 rugby clubs at the George Hotel, Huddersfield, in the north of England, leading to the creation of the sport of rugby league football. The Mat Salleh Rebellion in North Borneo is incited. September – Shelbourne F.C. is founded in Dublin, Ireland. September 7 – The first game of what will become known as rugby league football is played in England, starting the 1895–96 Northern Rugby Football Union season. Daniel David Palmer performs the first chiropractic spinal adjustment, on Harvey Lillard, whose complaint was partial deafness after an injury. September 24 to October 3 – the Automobile Club de France sponsors the longest race to date, a 1,710 km (1,060 mi) event, from Bordeaux to Agen and back. Because it is held in ten stages, it can be considered the first rally. The first three places are taken by a Panhard, a Panhard, and a three-wheeler De Dion-Bouton. Rudyard Kipling publishes the story Mowgli Leaves the Jungle Forever in The Cosmopolitan illustrated magazine in the United States (price 10 cents), collected in The Second Jungle Book, published in England in November. The London School of Economics holds its first classes in London, England. October 1 – French troops capture Antananarivo, Madagascar. October 8 – The Eulmi Incident: Empress Myeongseong of Korea is killed at her private residence within Gyeongbokgung Palace, by Japanese agents. 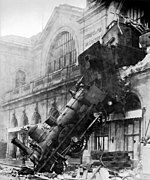 October 22 – Montparnasse derailment: A train runs through the exterior wall of the Gare Montparnasse terminus, in Paris. October 23 – The city of Tainan, last stronghold of the Republic of Formosa, capitulates to the forces of the Empire of Japan, ending the short-lived republic, and beginning the era of Taiwan under Japanese rule. October 31 – A major earthquake occurs in the New Madrid Seismic Zone of the midwestern United States, the last to date. November 8 – Wilhelm Röntgen discovers a type of radiation (later known as X-rays). November 17 – Flamengo, a well known professional football club in Brazil, is officially founded. November 25 – Oscar Hammerstein opens the Olympia Theatre, the first theatre to be built in New York City's Times Square district. November 27 – At the Swedish-Norwegian Club in Paris, Alfred Nobel signs his last will and testament, setting aside his estate to establish the Nobel Prize after his death. November 28 – Chicago Times-Herald race: The first American automobile race in history is sponsored by the Chicago Times-Herald. Press coverage first arouses significant American interest in the automobile. Ottoman troops burn 3,000 Armenians alive in Urfa . The Fourth Anglo-Ashanti War begins. December 7 – A corps of 2,350 Italian troops, mostly Askari, are crushed by 30,000 Abyssinian troops at Amba Alagi. December 11 – Svante Arrhenius becomes the first scientist to deliver quantified data about the sensitivity of global climate to atmospheric carbon dioxide (the "Greenhouse effect"), as he presents his paper "On the Influence of Carbonic Acid in the Air Upon The Temperature of the Ground" to the Royal Swedish Academy of Sciences. December 15 – The railways of the Cape of Good Hope, Colony of Natal, the Orange Free State, the South African Republic and southern Mozambique are all linked at Union Junction near Alberton. Kingstown lifeboat disaster: 15 crew are lost when their life-boat capsizes, while trying to rescue the crew of the SS Palme off Kingstown (modern-day Dún Laoghaire), near Dublin, Ireland. George Washington Vanderbilt II officially opens his Biltmore Estate, inviting his family and guests to celebrate his new home in Asheville, North Carolina. December 28 – Auguste and Louis Lumière display their first moving picture film in Paris. The world's first portable handheld electric drill is developed, by brothers Wilhelm and Carl Fein in Germany. The Swarovski Company is founded by Armand Kosman, Franz Weis and Daniel Swarovski in the Austrian Tyrol, for the production of crystal glass. The name HP Sauce is first registered in the United Kingdom for a brown sauce. The Duck Reach Power Station opens in Tasmania (the first publicly owned hydroelectric plant in the Southern Hemisphere). The first Boxer dog show is held at Munich, Germany. A huge crowd at the first Welsh Grand National at Ely Racecourse, Cardiff, breaks down barriers and almost overwhelms police trying to keep out gatecrashers. German trade unions have c. 270,000 members. October 26 – Laura Třešňáková°, Czech actress (d. 1969) °-See Czech Wikipedia Page. ^ Derfler, Leslie (2002). The Dreyfus Affair. p. 2. ^ McCullough, David Willis (October 8, 2000). "The Fairy Defense". The New York Times. Retrieved March 23, 2007. ^ Weale, Bertram Lenox Putnam (1905). The Re-shaping of the Far East. pp. 431–437. ^ therfl.co.uk. "Key Dates". History & Heritage. Rugby Football League. Retrieved May 27, 2012. ^ Gottheimer, Josh; Bill Clinton, and Mary Frances Berry (2004). Ripples of Hope: Great American Civil Rights Speeches. p. 128. ^ "A Fundação". Flamengo's official site (in Portuguese). Archived from the original on April 10, 2017. Retrieved April 9, 2017. ^ Berger, Michael L. The automobile in American history and culture: a reference guide. p. 278. ^ The London, Edinburgh and Dublin Philosophical Magazine and Journal of Science April 1896. p. 237. ^ "Youngsters are odds on to uncover history of racecourse". Wales Online. February 13, 2009. Retrieved August 20, 2015. Appletons' Annual Cyclopaedia and Register of Important Events of the Year 1895: Embracing Political, Military, and Ecclesiastical Affairs ; Public Documents ; Biography, Statistics, Commerce, Finance, Literature, Science, Agriculture, and Mechanical Industry (1896); highly detailed compilation of facts and primary documents; worldwide coverage. not online. This page is based on the Wikipedia article 1895; it is used under the Creative Commons Attribution-ShareAlike 3.0 Unported License (CC-BY-SA). You may redistribute it, verbatim or modified, providing that you comply with the terms of the CC-BY-SA.